One of the best things about being an experienced commercial photographer is the ability to see beyond the physical and to dream up exciting concepts that have a wow factor for the client. This project was no different, but it did push my imagination and creativity to a new level. I’ve been working closely with the University of Salford on a good few projects lately and after creating the images in the last post, they were keen to see what I could make of a couple of rooms that had been photographed previously but needed a fresh pair of creative eyes on them. 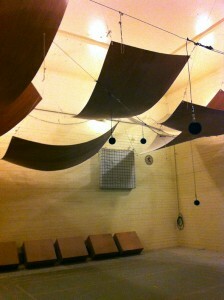 The first room I was taken to was the reverberation room, which is a pretty blank room barring a few shaped acoustic boards and microphones suspended from the ceiling. We visited the anechoic chamber next which had a lot more visual interest, pyramid shapes surrounding all the walls and pointing into the centre of the of the room. See images below. Both rooms have been photographed before by other photographers and although the sound dynamic in both is interesting to listen to, the reverberation room is visually bland. Plain walls and ceiling mounted acoustic boards meant that the balance of the room was very top heavy and we’d need to add some visual interest into the middle and bottom thirds to create some balance. 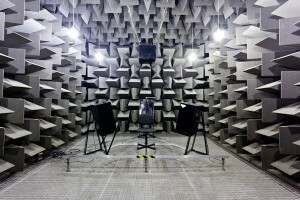 The anechoic chamber had a different set of challenges. The chamber itself has been photographed many times by a variety of photographers, however the challenge was to provide something unique and visually exciting. Although the interior is architecturally pleasing, the monotone colour of the foam dampeners didn’t provide much colour stimulus. Given the fairly blank canvas we had to work with, I imagined that these rooms would lend themselves to some experimental light painting. 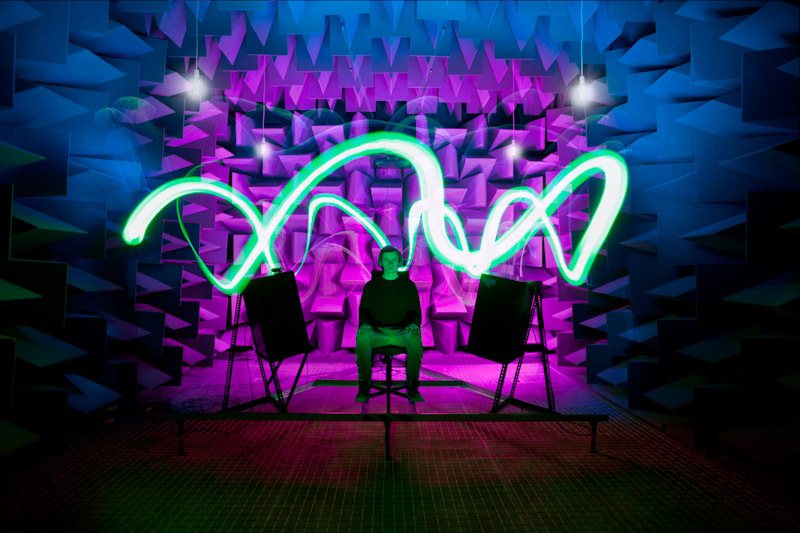 I envisaged creating wave forms out of light to emulate sound waves within the spaces. I’d also use the light painting technique to colour the interior walls to provide the much needed colour saturation and drama. Armed with a mixture of different size torches, continuous lighting equipment and coloured gels, I set up a sturdy tripod and plunged the rooms into almost total darkness. Pre-focussing the camera, I dialled in a long shutter speed of approx 20secs and set the f-stop to a medium depth of field (f8). Given the relatively short duration of time, I had to work quickly and methodically, making sure not to dwell too in any area otherwise I’d be captured in the image. I decided to capture a number of images of the various elements we wanted to introduce into the final picture and using different lights sources allowed us to produce a broad wash of light and then switching to smaller torches to capture the smaller details. The elements from each frame were then extracted and layered up in Photoshop to create the final composite. Top tip: its incredibly important that the tripod and subject not move between frames if the layering in post is to be successful. I’m really pleased with the final composite images, I hope you like them too. Perhaps in a future post I’ll cover what goes into the compositing of these types of images, but for now I hope you enjoy the images. Click below to see both room images. If you think you’ve got an un-interesting room or difficult environment to photograph, why not get in touch and I’m sure I can make something special out of it.